I grabbed a few minutes of Roger Yates’s time today. He’s Plan International’s Director of Disaster Response, with over 25 years of experience. We identified 10 key lessons for NGOs responding to Typhoon Haiyan in the Philippines. They are borne out in plenty of evaluations (e.g. see the box below on the 2004 Tsunami). 1. Focus on the priorities. Don’t try to do everything at once. Accept initial levels of choas and confusion. Immediate priorities probably include: (a) understand how things are working in the Philippines, and who is doing what; (b) develop initial plans based on local needs not what donors have to give; (c) think ahead when organising initial work, so it will be relevant in the coming weeks. Prepare to adapt priorities as circumstances change in the coming weeks. 2. Understand the role of the army and the government. The army will probably play a leading role in the initial response, with international assistance. They may run the airport, clear major routes, oversee logistics and provide security (in due course). NGOs should understand how the army is organised and what they see as their role – as well as how government is organised. NGOs may be able to influence what they are doing and define complementary roles. For instance, NGOs may be better at running distributions and engaging with marginalised people. 3. Work with local municipality/city leaders and other community leaders. They know who lives (or lived) where and how things work. Though they probably do not have strong capacity to deliver relief. NGOs should listen to city, municipality and barangay leaders when they are (a) designing relief activities and identifying who to give relief to, and (b) reviewing how to improve their activities. 4. Keep the public (in affected communities) informed about: (a) when and where NGOs are going to provide assistance; (b) key public health messages, (c) how people can give and get information about missing people / mortalities, and (d) other priorities that emerge for affected people (e.g. transport options, role of authorities). NGOs can put up notice boards, distribute leaflets, broadcast messages by radio and use local media & networks. 5. Work collaboratively, not independently. NGOs should recognise their role as one part of a locally-led, wider effort. All NGOs should consider other actors’ plans when they design their own activities and share information about their activities. They should publish their needs assessments and plans on-line (using co-ordination websites like Humanitarian Response or GDACS). They should support local partners and organisations. All NGOs should be prepared to adapt what they’re doing in the light of what other actors are doing. And donors should support this flexibility, when necessary. 6. Go the extra mile to find the most vulnerable and worst affected people (e.g. adolescent girls). They are likely to have specific needs and to be easily ignored or side-lined by mainstream relief efforts. 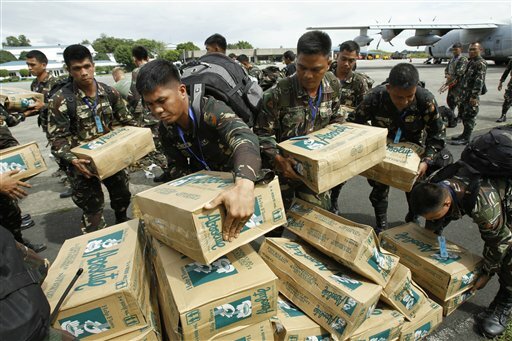 NGOs can play an important role in making sure they benefit fully from official relief. Though this will likely need specific resourcing. 7. Don’t underestimate the importance of mental well being. People need help in dealing with immediate shock, trauma and grief – as well as help in coming to terms with what’s happened to their families and their plans for the future. NGOs can help reduce stress, for instance by encouraging practical mutual support within communities (e.g. around accessing aid), avoiding huge life changing decisions and treating people with kind dignity. 8. Support local markets and move to cash transfers as soon as possible. Local markets are probably working better than assumed. They will improve rapidly as opportunities arise and create jobs, dignity and normality. NGOs should support local markets as much as possible. For instance, they should buy goods locally wherever possible and give people money (through cash transfers) so they can choose what to buy for themselves. 9. Build up two-way communication with the local public. In the coming weeks, NGOs should provide more information to the public about how to get in touch with them. Every time an NGO logo or noticeboard is put up, it should include contact details of named members of staff. NGOs should be transparent about their plans and budgets. They should make use of local media outlets. They should ensure that local people are involved in designing projects. And they should systematically ask local people for comments and feedback about the relief they provide – and respond to their comments. Donors should support this flexibility. 10. Building permanent houses is difficult. Don’t rush into it! Thoughtful construction takes time, involving many social and legal issues as well as technical ones. NGOs shouldn’t expect that people can move from temporary shelter (like tents) to permanent houses in a year. They may be stuck in tents for a long time. Interim housing may be an important option. NGOs should consider providing people with reasonable quality housing materials – or money to buy their own. This is very useful – thank you both! However re point 6, there is substantial, well researched evidence that shows two vulnerable groups in particular are routinely overlooked by humanitarian agencies and donors in humanitarian responses: older people and people with disabilities. Please highlight this and help to avoid it happening yet again. All the 10-points make eminently good sense and are all too often forgotten in the dash to respond. Having recently finished a study on learning and improvement in National Disaster Management Authorities, point 5 had resonance; ‘NGOs should recognise their role as one part of a locally-led, wider effort’. I’ll be interested to see how this aspect of the response shapes up – while there have been some recent changes, the Philippines NDCC certainly has capacity and an approach by international agencies that offers the opportunity of local leadership – and shared lessons learning at a time that is appropriate – would represent encouraging progress. It has been a bit It is a bit depressing to hear senior OCHA staff, who should know better, talking about the need for mass burial to prevent disease… We do know that dead bodies only pose a particular disease threat when they have died from disease. What is critical is that families will be able to know the fate of their loved ones, and this implies organised mass fatality management rather than mass burials. This highlights again that there is no requirement for anyone in the system to have any formal training, so the same myths are propagated yet again. A second issue is that some of the other lessons I have seen are based very much on the Haiti experience. The Philippines is not Haiti. There are some commonalities, like the reliance on remittances, but many more differences. Not only is the Philippines lower middle income, but it has a far vibrant governance culture. People expect services from their government, and despite some problems, get them to some extent.The problems reported on the news stem from the government failing to provide those services. Anyone responding to the disaster and expecting to apply lessons from Haiti cookie cutter style is going to have problems. Finally, it should be noted that the town that is getting the most attention in the news, Tacloban, seems to have been destroyed by a storm surge rather than by wind and rain. Thus the type of damage elsewhere will be different. Tacloban lies at the head of the San Pedro e San Paulo Bay just as it narrows to the San Juanico Straights. This means that as Tropical Storm Haiyan pushed up the bay, the geography of the bay could have led to a very severe storm surge here. Nice one, Alex, I say that you take in the feedback and send it out as a press release. The key words are consultation, collaboration and coherence. Let’s not have another Tsunami disaster after the disaster and restore a bit of public confidence in international aid agencies! Re Point 10. Don’t forget to let the relevant government entity take the lead in planning/housing in the recovery phase……it is their country. Very informative and issues are clearly addressed. Agreed that NGOs should work collaboratively with local municipalities and other agencies involved.